Michel de Montaigne may have been correct back in the 1500s, but today, things have changed. Today, there are hundreds of travel neck pillows to choose from, all of whom claim to be better than the rest. Sure, some people can avoid this decision entirely by flying business or first class, but for most of us that’s not an option. So, to put them to the test and discover who’s truly the crème de la crème, we put 14 of the top-rated and best travel neck pillows on Amazon and across the web through the most realistic trial we could think of: we flew across an ocean with them. Some of them were bad from the start, some of them had us dropping in and out of an irritated slumber, and one pillow rose well above all the rest. 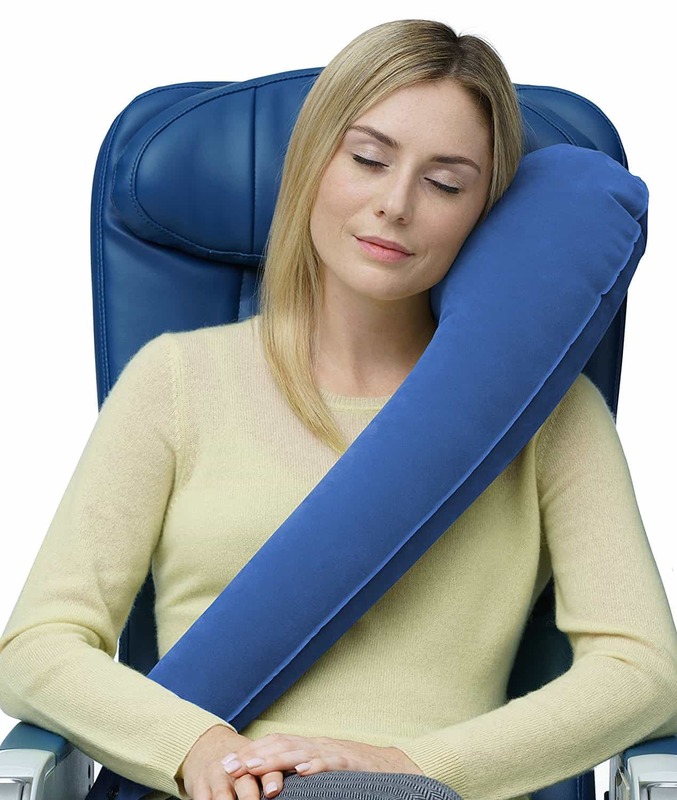 What’s the world’s best travel neck pillow for long flights? You should get this pillow if you… Want to travel lightly and comfortably, be able to store it easily within your backpack or suitcase, and wash it regularly. You shouldn’t get this pillow if you… Want to also use it out of transit, such as while camping or in another lie-flat sleeping situation. Why The REI Self-Inflating Travel Neck Pillow? The REI Self-Inflating Pillow ($20) is just the shape you’d want from a travel pillow: it has subtle supports that come around both sides of the head while also fitting snugly behind your neck in a way that promotes rapid time-to-sleep. At just 4 ounces, REI has managed to strike a great balance between convenience, size/weight and comfort. It’s firm while still being comfortable, and its exterior polyester feels both soft and highly durable both in your hands and against your neck/head. The back of the pillow has about a dozen silicone stripes, which I call “friction lines,” to keep the pillow in place—whether it’s on your shoulder, a plane seat or against a damp window—and ensure that your sleep is as comfortable as possible. Another bonus of the polyester exterior is that the pillow is very easy to hand-wash, something that can’t be said about other pillows that have a plush exterior. When you do wash the REI pillow, it feels noticeably clean. Inflating and deflating the REI pillow is perfectly simple, since the valve in the top corner of the pillow clearly shows how to lock and unlock it. The pillow self-inflates in under five seconds, and no equipment beyond your two hands are required. Of course, as with any self-inflating object, the pillow will inflate until it sits at the same air pressure as its surroundings, but if you prefer to inflate your pillow to a higher air pressure to create a more bulbous shape, simply blow into the valve and lock it when you’re satisfied. Deflating the pillow is as easy as pulling the valve to its unlocked position and squeezing the air out of the pillow. You can also roll it like a sleeping bag to get all the air out, if that’s easier for you. Another reason REI’s is the best inflatable travel pillow is that if it gets a hole in it, it still works thanks to its polyurethane foam filling (most other inflatable pillows would be garbage at that point). The REI pillow also comes with a sleek, high-quality travel sleeve (with a drawstring) to hold the pillow in transit. When packed into the travel sleeve, it measures about 10” x 6”, or about the size of a grapefruit. While the peanut shape of the REI pillow is ideal for the sitting-up or side-leaning use case, such as a plane or a train, it’s not as comfortable in a more regular lie-flat sleep setting. If you’re planning to use your pillow both while en route and at your destination—perhaps while camping or crashing at a friend’s house—you may want to supplement it with a thick sweater or some wool socks for added comfort. All in all, the REI Self-Inflating Travel Neck Pillow is an excellent choice for sleepers of any type using the pillow in transit. It’s comfortable, packs easily, highly durable and super easy to clean. If you’re saying, “What about the AirComfy?” right now, good on you. Though the REI and the AirComfy Inflatable Back & Neck Lumbar Pillow ($20) are both the same shape and both inflatable (REI is self-inflating, AirComfy you inflate manually) with inner foam, we tested them side-by-side and are confident that the REI pillow is superior to the AirComfy pillow for two crucial reasons. First, as soon as you hold them both, you can feel that the REI is more durable. REI has been making camping and outdoor equipment for 75 years, whereas AirComfy is much newer, so it’s no surprise that REI really nailed it with the exterior material here. Second, inflating the AirComfy can be a pain, since there’s only a single valve and air escapes as soon as you stop inflating it. This sounds trivial, but it happened a lot during our testing, while the REI inflated perfectly every single time. Most of you should stop reading here. Honestly, most of you should stop reading here, since we truly believe that the REI is the best travel neck pillow on the market. If you’re deciding between REI and another pillow you’re already familiar with, you can read on, but if you’re just looking for a recommendation, here it is: Get the REI! If we had to choose a runner-up, it’d have to be the Comfort Master Pillow ($19). The Comfort Master is made entirely of memory foam so it’s really soft and squishy, and the microfiber exterior is also quite soft. There’s also a thin elastic strap attached to the rear of the pillow, designed for attaching it to the handle of your suitcase while in transit or to your headrest during use. The Comfort Master supports the head and neck nicely because it wraps right around the neck and below the chin on both sides, so you can sleep comfortably with your head toward either side. With that said, one thing we’ve noticed in every U-shaped/hemidonut pillow that we tested is that when you tilt your head back to sleep while sitting in a high-backed plane or train seat, the back of the pillows push the head forward in a way that can be uncomfortable for a lot of users. You can unzip the exterior of the Comfort Master and hand-wash it separately from the pillow itself, though it does dry mysteriously slowly—it took about 12 hours for it to air dry when we washed it. It can also be tough to get the cover back onto the pillow after you’ve washed it, both because of the awkward shape and the mediocre-quality zipper that fastens it all together. A final note: anyone with a thick neck or who is over six feet tall may want to look elsewhere. The Comfort Master pillow fits quite tightly around larger necks to the point of moderate discomfort, so if that’s you, don’t risk it with this one. Another U-shaped pillow we tested was the TravelRest Ultimate Memory Foam Neck Pillow ($30). Due to its unique shape, it works well on high-backed or low-backed seats and allows users to comfortably tilt their heads backward, something the Comfort Master does not. It also compresses into a similar grapefruit size as our main pick, the REI pillow, but because it’s a memory foam pillow rather than a self-inflating one, it weighs about 13 ounces compared to REI’s 4 ounces. Also similar to REI, the TravelRest Ultimate has friction on the back so it won’t slip and slide against smooth headrests or damp windows. For these reasons, we found it to be slightly better than the Cabeau Evolution Pillow ($40), another one which we tested that is similar in structure and makeup, though neither match the quality of the Comfort Master. If you don’t travel very often and just want to purchase the entire “good night’s sleep” package all at once, the Aeris Memory Foam Pillow ($25) is a decent option. Again, the Aeris itself is not as good as the Comfort Master when comparing apples to apples, but because the Aeris comes packaged with a sleep mask and earplugs all for $25, it makes for a reasonable one-stop shop. If you aren’t in a rush to make a decision, though, do your future self a favor and choose the REI or the Comfort Master if you’re set on having a U-shaped pillow. The Comfy Commuter Original Pillow ($40) is filled with a 15% cotton, 85% polyester blend rather than memory foam, which means it offers significantly less support than other memory foam pillows and also isn’t as easily compressed. However, it does solve the “head pushed forward” problem that the Comfort Master and other U-shaped pillows have by entirely removing the fabric from the back of the pillow. The Velcro strap at the front keeps the Comfy Commuter pillow in place while you wear it, though we found that using the Velcro made our neck feel tight and immobile, which in turn drastically reduced the overall comfort of the pillow. If you don’t use the Velcro, though, there’s no support either forward or backward, so the Comfy Commuter has us in a bit of a catch-22. Its carrying case is permanently attached to the back of the pillow and hangs down behind your head like a curtain when you wear it, which can be uncomfortable and irritating if you aren’t wearing a shirt that covers your entire back. The inflatable Sea to Summit Aeros Pillow Premium Traveller ($42), not to be confused with the Aeris Memory Foam Pillow mentioned earlier, also fell short for us. The good news is that at just 2 ounces it’s super light, fits into the palm of your hand when packed away, and very easy to inflate and deflate, thanks to its dual-valve design. However, it offers very little support when leaning forward or to the side, and on low-backed chairs without a headrest to lean backward against, it loses its effectiveness entirely. Again, go with the Comfort Master if you like the U-shape. A few of the travel neck pillows we tested have some truly unique designs, though don’t assume they were all design improvements. We tested the TravelRest All-In-One ($27), but its large banana shape was tough to get used to, and none of us found a need for its extremely bulky design once inflated. Did we mention it only sits on one side of your head so that if you lean to the other side, you’re out of luck? That, combined with the overall lack of head and neck support it offers, defeats the purpose of the pillow altogether, wouldn’t you say? We also tested the Caldera Releaf Travel Neck Rest ($19), which looks and feels like a neck brace, wraps all the way around the neck with a Velcro strap at the back. It offers a lot of support, of course, but not much in the way of comfort, and we found it to be too constricting to use regularly. Don’t even think about eating with the Caldera Releaf on. Another unique design that we tested was the Trtl Soft Support Pillow ($30). Essentially a scarf with a built-in plastic support, the Trtl offers solid support for a side sleeper or front sleeper. Part of the Trtl is made of hard plastic, which makes it quite awkward to pack, and you’ll go crazy if you try wearing it with headphones, since it consistently knocks them out of your ears as you move to find a comfortable position. The Trtl could suffice for a short trip, but it’s definitely not the best travel neck pillow for long flights. The last really unique design that we tested was the SkyRest Pillow ($30). Don’t be alarmed by the SkyRest pillow’s odd shape—it inflates into a massive cube with a slanted top—because it’s designed solely for stomach sleepers. To use it, inflate it and rest it on your lap, put your hands in its rear pocket, and plop your head down onto the top of the pillow. It’s actually fairly comfortable if you’re a stomach sleeper (assuming the seat in front of you is not reclined at all), but it’s completely useless if you’re not a stomach-only sleeper, plus the size alone makes this one a no-go for us. The J Pillow ($30) gets mentioned a lot in discussions among pillow connoisseurs (pillosseurs?? ), and there’s one major reason why: it’s designed exclusively for side sleepers. The J Pillow is machine-washable and machine-dryable and boasts a handy carrying strap, which is nothing short of necessary given that there’s no way its bulky shape would fit in any normally-packed suitcase. It runs into the same issue as the Trtl pillow, though, which is that wearing headphones and even glasses becomes annoying when using the J Pillow, since it intrudes onto the side of the face while wearing it. The J Pillow is filled with 100% polyester, which means it doesn’t offer as much support as the memory foam pillows, and like the TravelRest All-In-One, it only works on one side at a time. If you feel like leaning the other way while you sleep, you’re out of luck here. You’ve probably seen the Ostrich Pillow ($100!) when it was going viral on social media a year or two ago, widely popularized by this video by Lewis of Unbox Therapy. If not, here’s the deal with it. The Ostrich Pillow’s internal microbeads are extremely soft, it’s surprisingly light for its size, and it fits like an astronaut helmet, a travel neck pillow and sleep mask all in one package. Like the SkyRest pillow, the Ostrich is mainly designed for stomach sleepers who would rest their head forward on an airplane tray table, but unlike the SkyRest, it could also be used in a regular seated position. There’s a bit of neck support but not as much as most side sleepers would like, though the soft exterior fabric does compensate a bit by making it comfortable to lean against the window (or the passenger next to you, if you dare). Beware that it does get warm in there, but if you’re a stomach sleeper that doesn’t mind looking like Deadmau5 while you snooze, this is definitely a more portable, and a more comfortable, option than the SkyRest. One more thing to keep in mind for the Ostrich Pillow: don’t wear it straight out of the box! Though Lewis doesn’t show it in the video here, when you unbox it for the first time, expect a pretty strong “new car” smell (that’s the scent of chemicals you’re smelling, by the way). Try to wait at least a week to get rid of that smell before throwing it over your entire head and face for a transoceanic flight. Final thoughts on the Ostrich Pillow: it’s too big, too difficult to wash and dry, and certainly not worth the whopping $100 investment. If you made it all the way down here, congratulations! We love writing really in-depth guides to making great travel decisions. If you liked the amount of detail and time put into this guide, you’ll probably appreciate our N26 Review, where I go deep on the online bank that saved me over $1,000 in my first 8 months of using them, all with no effort on my part, or our TransferWise Review, which shows you how to get fee-free currency conversion around the world. Enjoy!